What’s Wrong with… The Berenstain Bears? The Berenstain Bears series is a well-known and loved set of children’s picture books, some of which I, too, enjoyed immensely. But it’s hard to create hundreds of books without some bad stuff slipping though, so let’s have a look at some of the problems with the books I’ve reviewed, so far. It sounds like a good name for a band, to me, and it pretty succinctly describes the problem with some of these books. Notice any similarities in these? In these, and quite a few others, Mama is standing off to the left, looking at her family, furious. This is partly just laziness in composition of the image–the adults are often standing off to the left in Berenstain Bears covers, angry or not, but Mama is the usually the one raging over some slight–Papa is more likely to join in on whatever misbehavior has Mama so angry. But, this isn’t even accurate. Although Mama is generally dispensing sage wisdom from on high (“Stop doing that! Don’t! Be more polite!” and on, and on, and on..), she doesn’t generally actually get very angry. The covers that depict her as some kind of inhuman (un-bear?) monster, raging at her family and the world, are generally just lying about what’s happening in the book. It’s like putting Wolverine on the covers of comics, even if he only gets a brief cameo–I guess an angry Mama Bear sells books. A good name for a debut album? Ragin’ Mama and the Lying Covers present Hypocrisy, in their studio debut! Maybe not. Some of the Berenstain Bears books are overly moralizing, and even the often-amusing artwork can’t always make up for that. But what’s especially bad about it is that Mama isn’t always the paragon of virtue she is portrayed as. I noted in my review of The Berenstain Bears Forget their Manners that I thought Mama’s approach to correcting her children’s manners–screaming at them–was worse than the ‘crimes’ that she was complaining about, like ‘playing with food.’ Let’s have a look at the pages that I’m talking about. Maybe it makes me a liberal hippy something-or-other, but I just don’t think that screaming at your children and beating your fists on the table while they’re trying to eat is the best parenting method. It certainly doesn’t seem polite. Intimidating, yes. Polite, no. I mentioned in my review that The Berenstain Bears in the Freaky Funhouse contains a spectacular example of hypocrisy: Mama repeatedly scolds her children for gossiping about grownups, but feels no compunction against gossiping, herself. The lesson, of course, is that some people are more equal than others, and adults are above children on the ladder of ‘more equal.’ Pure hypocrisy. 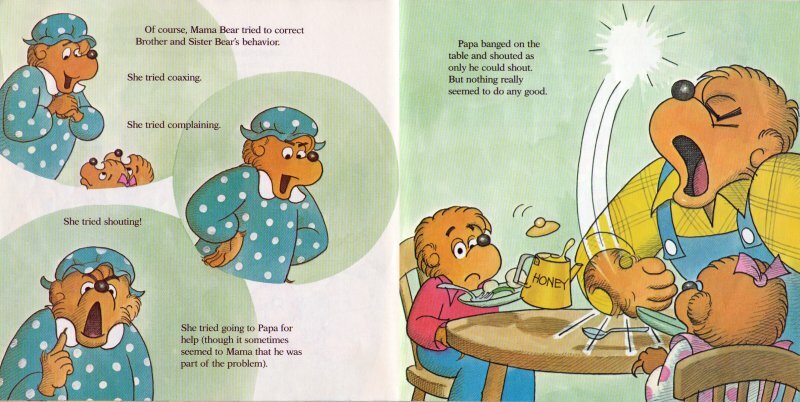 This isn’t one of the most common problems with Berenstain Bears books–Mama is usually portrayed as the perfect embodiment of whatever virtue the book is pushing, which can be pretty irritating–but it is one of the worst. If you want to try to teach kids good morals, you’d better examine your own, first. Moralist, chastise thyself. Good for design, not so much for writing children’s books. Some Berenstain Bears books have a story that’s just an excuse to teach a lesson. I presume that the idea was that parents would think “Gee, my kids are ungrateful brats, how can I get them to shut up and stop asking for new toys?” Said parents would then see The Berenstain Bears Count Their Blessings in the store, and know that it was the right tool for the job. Ditto for The Berenstain Bears Forget their Manners, obviously a prop for parents hoping to introduce a system of harsh punishments for minor transgressions, The Berenstain Bears and Too Much Junk Food, for parents with children who (through no fault of the parents!) eat too much candy, and The Berenstain Bears and the Truth, for parents whose children are dirty liars. Maybe I’m being unfair to these books. The scene with the ever-more-exotic imaginary bird in The Berenstain Bears and the Truth is amusing, and… well, the artwork is pretty competent in the others. The Berenstain Bears Count Their Blessings teaches some science. Incorrect science, but, hey, at least they tried! There’s one common theme here–the books are overly moralizing, and the flaws all stem from that problem, either through incompetence or zeal. The moral should reveal itself naturally through the story. If you start by thinking “How can I teach those brats to be civil?” and write the story from there, you’ve made one mistake (and a big one) already. In short, your story needs to be sincere. If you’ve got an ulterior motive, it’ll show.